Christian themes and symbolism are ever-present in anime and manga works, from the surface-level use of nuns (Toaru Majutsu no Index, Trinity Blood) and crufixes (Kannagi, Neon Genesis Evangelion) to deeper themes that also have universal relevance, like redemption (Trigun). Japan, however, is not by any means a “Christian” country. And so, I think it surprised many to see the deep exploration and use of Christian themes and symbolism in Haibane Renmei, a series adored by critics and audiences alike. While it contains ideas that cross a variety of religions (Buddhism particularly), Christian themes are most strongly present in the series. 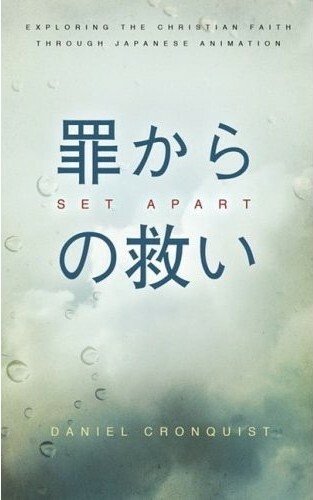 In his book, Set Apart, Daniel Cronquist analyzes these ideas which, while perhaps not purposely present in the show (according to creator Yoshitoshi ABe), are nevertheless undeniable. Cronquist, luckily, analyzes these ideas for us. For instance, he discusses the setting as representing purgatory, explaining the concept of this afterlife destination briefly for those unfamiliar with it and drawing connections between that setting and the one in the series. The author’s discussion of Haibane Renmei’s settings is particularly insightful, especially when he writes about the river underneath the walls surrounding the city of Guri. Another interesting comparison he makes is between Rakka’s encounter at the well and the Samaritan woman’s encounter with Jesus at a well. The author provides great insight here, discussing how each woman undergoes spiritual transformation at a well based on receiving the truth. I was also impressed that the author covered the entire series without stretching to make comparisons. The first third of Haibane Renmei, on a surface level, doesn’t seem to contain much to speak of in relation to Christian thought. But Cronquist masterfully draws connections that I would have otherwise missed. For instance, several pages in these chapters discuss the idea of contentment in any situation, as prescribed by Paul in the Bible, and how the Guri townspeople view the haibane in light of this practice. Set Apart is written in episodic order, which makes it easy to follow and particularly useful as both a series guide and study material. In fact, Cronquist adds review and critical thinking questions at the end of each chapter that help the readers digest the material. Though obviously written with a Christian frame of mind, the supporting evidence is presented well enough that I think those not of the faith may find it very interesting, and so the book would be just as at home in an anime club looking for reading material to accompany a series as a youth or young adult Bible study. The monograph is also a fun and quick read for readers in a solitary environment. And its value is not just in the analysis, but also in simple explanation. For instance, certain events in Rakka’s backstory and in her search for forgiveness were confusing to me, but Cronquist’s explanation of the events clarified these vital parts of the series. Cronquist doesn’t cover every major connection between Haibane Renmei and Christianity, though. As a previous review mentioned, he misses some points that other viewers have made. I also wondered about the book’s purpose at times. As I mentioned, it walks the line between Christian and non-Christian in regards to its audience. That perhaps creates a problem in depth, as I felt a Christian audience might best be served by more application. Still, Set Apart is a gem of a book. It is unique among western texts on anime and is useful for both Christians and non-believers, and for those who have seen the series and those who have yet to watch it. In short, it belongs on the bookshelf of most any anime fan. I still need to watch this series. But I can say that I think it’s awesome that there’s a book about the series. I hope you’ll watch it – I think you’ll find it far different from the series you’ve been watching lately. I have this book in my wish list. I really need to buy it. Haibane Renmei is one of my favorite anime. It’s a very good read and works well as small group material. I really enjoyed reading it.